Create a web application which adds together the contents of 2 textboxes and displays the result in a label. Add 2 textboxes, a label and a button to the designer for Default.aspx. Extend the application to allow subtraction, multiplication and division. Extend the application to validate the values input to the text boxes. Create the skeleton of a web site which uses Master page, Themes and Navigation. Firstly, create the folder (giving it the web-site name) where you want to save your web-site. Select New and then Web Site. Make sure you select File System in the list box next to Web Location (at the bottom left of the window). Then browse to the folder you have created in the first step. 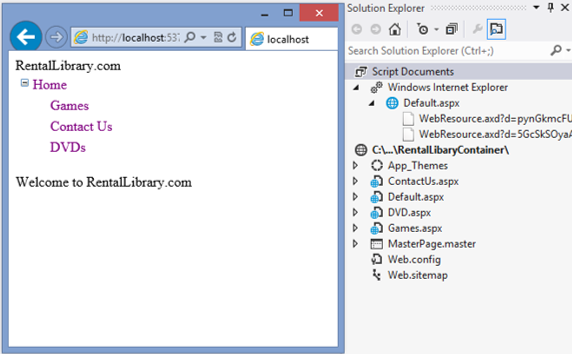 Select ASP.NET Web Site and click OK.
Add a theme called SimpleTheme. To do this, right click the Project in Solution Explorer, then select Add>Add ASP.NET Folder>Theme from the context menu. Add a skin file for a label to the theme. Call this Label.skin. To do this, right click SimpleTheme, then select Add>New Item …>Skin File. Add a Web.SiteMap file to the application. To do this, right click the Project in Solution Explorer, then select Add>New Item…>Site Map. Delete the existing master page and then add another one to the application. Right click the Project in Solution Explorer, then select Add>New Item…>Master Page. Delete the first ContentPlaceholder elements in the master page’s title. Only one ContentPlaceholder is needed. Add a label control to the master page, but make sure this is above the remaining ContentPlaceholder. Set the label’s SkinID attribute to “Title”. Include the text RentalLibrary.com in the label. Drag SiteMapDataSource and TreeView controls from the toolbox to the master page. Make sure again that these are placed above the ContentPlaceholder. Add a Web Form using Master Page called Default.aspx. Select the Master page you added in Step 3. Make Default.aspx the application’s start page. Add the text “Welcome to RentalLibrary.com” inside the page’s Content elements. Place this element inside the <system.web> element. Edit the Web.SiteMap to include navigation to all four pages in the site. Include each page’s URL, title and description. Store application settings in the web.config file. The name of a mail server will be held in this configuration file. It can then be easily changed without recompiling the application. Create an empty Web Application project called Configuration. Add a web form called Default.aspx. and set this as the start page. Place this element immediately below the <Configuration> element. Drag a textbox from the toolbox to the designer for Default.aspx. Import the Configuration namespace by adding this statement at the top of Default.aspx.cs. Run the web site to check if the application setting is shown. Create a web application that allows authenticated users to change their personal settings. An ASP.Net database will be created to hold usernames. Individual users can then store and retrieve a personal email address. Firstly you will need to locate the aspnet_regsql.exe tool in C:WindowsMicrosoft.NetFramework. This is to be found in either the V4.0.30319 folder or within the V2.0.50727 folder depending on whether you are running Version 4 of the Framework or earlier. When you run the application this will create a security database called aspnetdb. This is then automatically stored within SQL Server 2008. Next, go into Server Explorer (accessed via the View Menu within Visual Studio) and add a connection to the aspnetdb database. Create an empty web site called Membership. Add profile settings to web.config to store an email address (with a default of [not set]). Make sure this is located beneath the <configuration> tag. Add a page (Profile.aspx) with a label. In Page_PreRender add code to set the label’s text to the email address from the profile. Add another page, EditProfile.aspx, and link to it from Profile.aspx. On this page add a textbox to allow the user to enter an email address. Save these values in the profile. Here’s a site that can help you build your online store with free hosting.